After her win over Görges, Serena, seeded 25th in the tournament, was asked about the idea that her return to the top was inevitable. She rolled her eyes. On the one hand, that rings true. Given how Serena’s year has gone so far— after a dismal showing at the Fed Cup, she won two matches at Indian Wells, lost in the first round at the Miami Open, and then won three matches at the French Open before withdrawing with an injury—a deep Wimbledon run was no sure thing. On the other hand, Serena Williams being back in the Wimbledon final will always feel inexorable, like a settling of the natural order. When Serena plays Angelique Kerber on Saturday, it will be a rematch of the 2016 Wimbledon final, which Serena won, just as she did in 2015, 2012, 2010, 2009, 2003, and 2002. 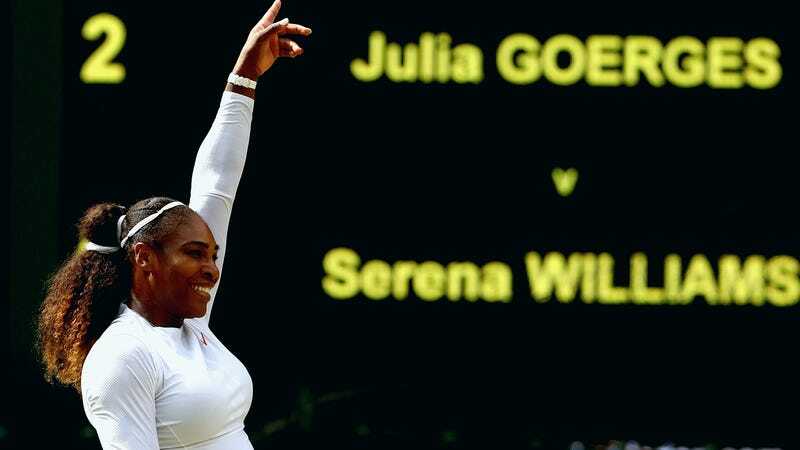 The current strength and striking parity of women’s tennis led to a historic number of upsets in the early going and may well have paved an easier than usual route to the final for Serena. Nine of the top 10 seeds lost in the opening three rounds, which meant that Serena, seeded 25th, didn’t even face another seed until the semifinals. As far as comebacks go, Serena’s Wimbledon run has been just about the most ideal possible scenario. It seems like a safe bet that she’s not going to squander it.